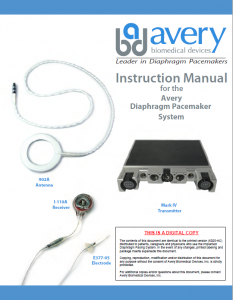 Initiation of Pacing - Avery Biomedical Devices, Inc. Refer to the Instruction Manual provided with each system for complete instructions on postoperative care and initiation of pacing. Make sure both sides are turned ‘OFF’. Then, insert batteries into transmitter. Set amplitude dials to 0.0 on both sides. Secure antennas over implanted receivers and connect to transmitter. Each hemidiaphragm is initially evaluated independently of the other. Discontinue alternate method of ventilation if required. Turn first side ‘ON’ and slowly increase amplitude control until threshold is reached. Threshold is the lowest stimulus amplitude which results in a diaphragmatic response and can be observed by visual observation, manual palpation, respirometer, fluoroscopy, or patient sensation. Gradually increase amplitude until adding amplitude no longer increases tidal volume or diaphragm reaches maximum deflection. Process should be repeated for the second side, allowing for the patient to rest on an alternative means of ventilation as necessary. Once unilateral amplitudes are determined and the patient is sufficiently oxygenated, both sides should be turned ‘ON’ and a bilateral tidal volume measured. Respiratory rate should be set so that minute volume is appropriate for the patient’s clinical needs. Thresholds can vary by up to 20%, so readjustment of amplitudes may be occasionally required to maintain tidal volume and patient comfort. Patients should be allowed to pace until indications of diaphragm fatigue occur. This can be observed by a 50% decrease in tidal volume, decreasing oxygen saturation, or increasing CO2 retention. Pacing should be resumed daily until 24 hour pacing, or desired amount, is achieved. For patients with little or no intraoperative response, or who have undergone a nerve grafting procedure, diaphragm reconditioning should take place asynchronously with a mechanical ventilator until such time as a sufficient tidal volume is obtained.